“Something doesn’t feel right about this.” Cartoon Network has announced new episodes of Steven Universe will return this May, Entertainment Weekly reports. 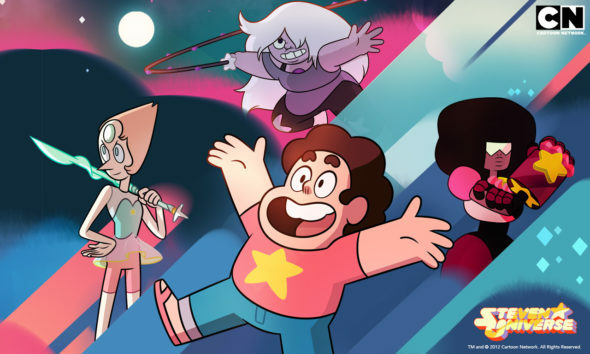 The animated series centers on a young boy, Steven, who lives with three magical aliens known as the Crystal Gems. The show has already been renewed through season five. The new episodes of Steven Universe are part of a four-week event titled “In Too Deep.” The special event will consist of five parts, beginning on May 12th with two back-to-back episodes. What do you think? Are you a fan of Steven Universe? Will you watch the new episodes? More about: Cartoon Network TV shows: canceled or renewed?, Steven Universe, Steven Universe: canceled or renewed? Uncle Grandpa: Cancelled by Cartoon Network? Dose that mean that the fourth season of SU will be finished or dose it only have 5 episodes?